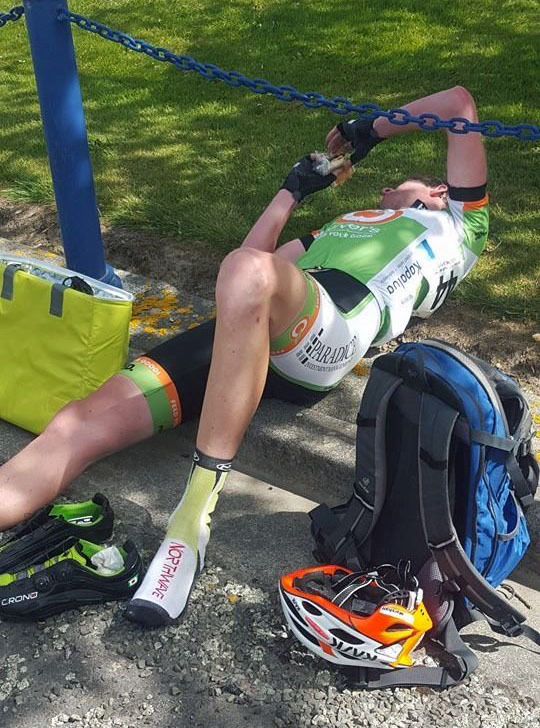 Monday was the first road race for the Tour of Southland and at 157 km (+4 km of neutral) in length and the wind due to get up, it was expected to be solid… And yes it was! I’m going to put it out there, but I have never ridden in cross winds as strong as we had to today. They were forecast to be 60 km/h and they were at least that! The 157 km stage took us almost 5 hours to complete and it was a relatively flat ride with all the hills being fairly short and not too steep. Avanti Racing Team were controlling the front of the race for the majority of the race – they can turn the pedals quite well! The last 20 km were done at an average speed of close to 60km/h for those in the front echelon. That’s an incredible effort as for much of the day the peloton was struggling to hold 30km/hr. My team mate Ryan Christenson managed to make the final front split from the peloton after 2 riders from the breakaway survived to take the stage. Roman Van Uden (PowerNet) took the stage win over Mark Ryan (Kia Motors), and with it the overall lead for the tour. The first major split of the day was at 40 km into the race with plenty of riders being blown off the road as we hit the first major crosswinds for the day. Most got back on but it wasn’t too long until there was another 6 echelons across the road at about the 70 km mark. Many chose to use the little ring in this section while leaning into the wind like they were railing corners at a criterium. The break was at 7 mins and it was starting to look like they weren’t going to be caught. At 130 km what was left of the bunch then split into 6 groups before a right turn with a roaring tailwind. This was where the pace turned right up, especially for the front group where we had Ryan. For the first time in the race a bigger chain ring was needed as the attacks were happening at 70 km/hr. Ultimately the two up the front stayed away to win by 1 min 33 sec, ahead of the first split from the peloton where Ryan sprinted to 10th place but more importantly claimed the U/23 leaders jersey in the process. Today’s stage will be a 155 km finishing atop of Southland’s most famous climb, Bluff Hill. It is stupidly steep and happens to be the southernmost tip of the south island of New Zealand. The temperature won’t hit double digits but fortunately the climb is less than 400m vertical. Snow above 400 metres is the weather forecast for today! Should make for another “solid” day of racing.